As many of you have probably heard by now, Greg Hardy made some eyebrow-raising comments when he spoke to the media for the first time since returning from his four game suspension. Since then, Cowboys owner Jerry Jones responded to Hardy’s comments in a equally dumbfounding way. 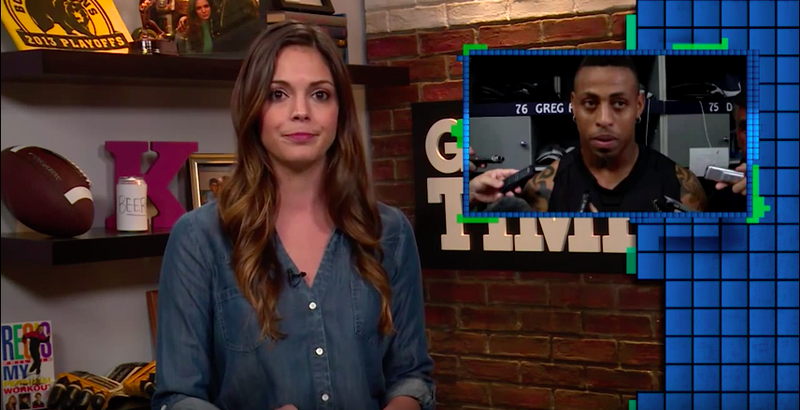 First, in case any of you still have no idea what I am referring to, here is an excellent video by Fox Sports’ Katie Nolan explaining the situation. While I usually try to not just post other people’s thoughts and videos on this site, there are always exceptions, and this three minute monologue by Nolan nailed it right on the head. Since Nolan’s video aired on Fox Sports 1 on her show Garbage Time – a highly recommended watch if you like jokes about sports – the owner of the team Hardy now plays for, Jerry Jones, reacted to what Hardy said. Well, Jones doubled down on Hardy’s dumb comments, after first uttering “Oh my goodness,” (which is a more appropriate reaction) to SI.com. “Well, you’re not allowed to have guns on the football field. We all know that’s just a way of expressing yourself. I hope his guns are ablazin’,” Jones said. Ugh. But what about the comments about Brady’s wife? “When I saw him marry her [Gisele], Tom went up in my eyes 100%. She’s very very attractive and it shows what an outstanding individual Tom is,” Jones told SI.com. The NFL world has gone mad. Now I grabbed those Jones’ quotes from a Yahoo! Sports article written about three hours ago. There was also an article written on ESPN about three hours ago with the same facts and quotes from Jones. While the ESPN article saying Jerry Jones was “taken back” is factually correct – Jones did begin his comments with the included, “Oh my goodness.” – saying Jones was taken back in the headline could lead people to miss everything else Jones went on to say after that first sentence. The Yahoo! article does not even attempt to frame Jones as “little taken back.” The Yahoo! article does include Jones saying, “Oh my goodness” in the article, but decides to focus on the other five sentences Jones was quoted saying. In a world where so many people, unfortunately, only read the headlines and tend to believe everything they see written on Facebook or Twitter, it really does matter the way things are worded or the way things come across. Just be clear, I am not a woman, and I also did not major in public relations, but it doesn’t take a genius to realize this was handled in the complete opposite way it should have been. And after having all the facts and listening to everyone talk about it repeatedly, I am not sure who deserves to be blamed. The National Football League, the media, the Dallas Cowboys and Greg Hardy all contributed to this situation in one way or another. Unfortunately, there are no repercussions for anyone I just mentioned. The Dallas Cowboys get to play their elite pass-rusher, and every single one of us will be sitting in front of our televisions on Sundays watching. This entry was posted in Home, NFL and tagged Dallas Cowboys, ESPN, Fox Sports 1, Garbage Time, Greg Hardy, guns blazing, Jerry Jones, Katie Nolan, National Football League, NFL, suspension, Tom Brady's wife, Yahoo! Sports. Bookmark the permalink.